It’s Sunday just past eight as we leave Mom behind at home. Dad wears the same dark gray suit he wears to work. His shirt is fresh and his tie knotted close to his Adam’s apple. My brother Dale, seven years older, wears a heavy, white sweater over his shirt, woolen knee pants, and Argyle knee socks. I’m in my new red coat with the matching red bonnet. Underneath I’m wearing the plaid cotton dress I had my first grade picture taken in. Dad tucks his bible under his left elbow and holds my left hand and Dale takes my right hand. We walk down the street past the other little houses on our cul de sac called Garden Court in South Point, Ohio. We stop at the highway and look both ways before we cross with care. As we wait for the bus that will take us part of the way to St. Paul’s Lutheran Church in Huntington, West Virginia, I start to pop up and down, toes to heels, heels to toes, rock back and forth with excitement. Then here the bus comes up the road. As my breath comes faster and faster still, the bus slows and stops with a wheeze of its brakes. The doors fold open and there he is. “Hi, Jesse,” I say, with bated breath as Dad and Dale swing me up the steep steps, and set me down on my feet next to the man in the broad leather-covered driver’s seat. “Hi, Jet,” he says, calling me by my childhood nickname. His name is Jesse Lemaster and I’ve been in love with him since the moment I first climbed onto his bus two years before. I’ve rarely seen him standing, but I can tell from the way he fills the space at the front of the bus between the big wheel and the lever he uses to operate the doors, that he’s tall and lanky. He has blue eyes and wears his nondescript brown hair short and slicked back. He wears his usual gray, short-sleeved shirt and gray wash pants. I pay no attention to Daddy, who probably puts money in the till for the three of us, and Dale, who obviously gets on the bus because he gets off with Dad and me in Huntington when we make our transfer to a city bus. I only have eyes for Jesse as I settle in the seat at the top of the steps. I wonder now why this seat was always empty when I got on the bus. Perhaps Jesse shooed other riders out of it just so I could have it on Sundays. I watch him pull the lever to shut the door, release the brake, and engage the clutch with one big foot. The bus eases back into traffic as I lean forward and start to talk. I tell Jesse what’s happening at home with Mom and our cocker spaniel Donny Boy that Daddy had since before I was born and Jersey Bird, the parakeet I picked out from among a hundred birds raised by Mom’s friend after he lost his feet in an automobile accident in New Brunswick, New Jersey. We brought Jersey Bird home on the train in a shoe box with holes in the top to live in a metal cage in the living room close to the furnace. I’ve already told Jesse about getting spanked in first grade for asking a kid across the aisle if I could borrow his red crayon, so I’m spoiled on the subject of school for a while. Jesse listens. Sometimes he smiles and glances my way as he drives the bus into town on Sunday morning so long ago. He did. And he reminisced. 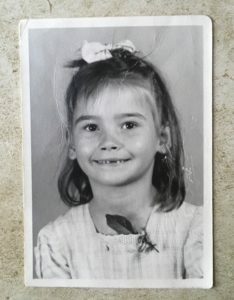 He said that when I was four, I was small and looked two. “But you spoke as clearly as you do now,” Jesse said, a man cooler and more remote than the man I loved when I was a little girl. Back then I knew absolutely that the attraction was mutual. For after all, Jesse gave me gifts. One Easter he was off-duty, so he sent an emissary. The guy who drove his route that day came up to our house with a basket wrapped with crinkly paper and filled with candy my mom must have parceled out to me stingily. I didn’t, of course, but I think it’s absolutely no accident that throughout my adult life I’ve been attracted to tall, lean men with light eyes. (Hey, Clint Eastwood still works for me! 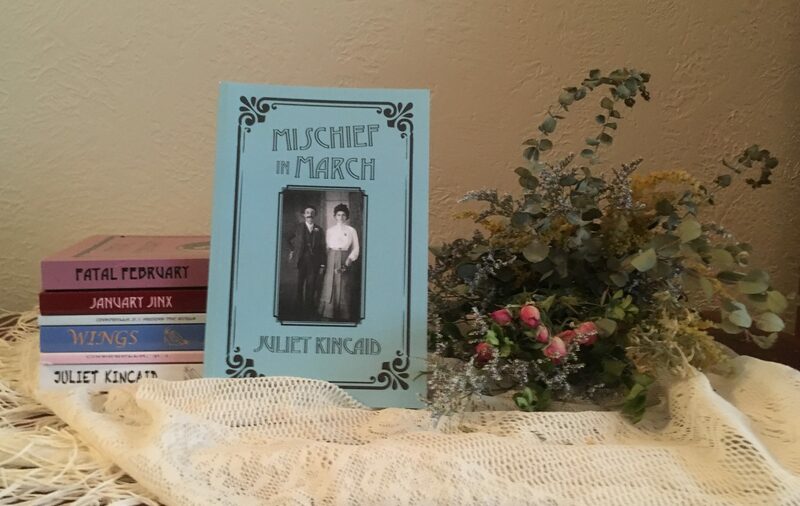 Juliet Kincaid writes the calendar mystery series, set in Kansas City about a hundred years ago, and the Cinderella, P. I. mysteries that feature Cinderella, twenty years, three kids and a few extra pounds after the ball. All her stories and novels are available as Kindle eBooks and trade paperbacks from Amazon.com. This is an amazing book and absolutely should not be missed.